It is still possible, in modern Taipei, to get a taste of ancient China. Lin Family Garden, a beautiful oasis in the suburb of Panchiao, is Taiwan's finest example of classical Chinese-style landscaping and residential architecture, and is reminiscent of a serene village from a bygone era. The nearly three-acre garden follows classical Chinese principles: flowers, artificial mountains, rocks, streams, and ponds symbolize nature, while manmade elements -- cottages, pavilions, towers, and bridges -- complement the setting. 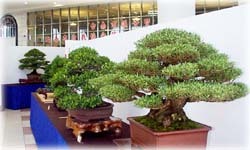 Min Hsuan Lo received the grand prize of the JAL World Bonsai Contest in 1999 and he has won several other honors since. He was one of the headliners at BCI 2004 in Taiwan and has traveled to Malaysia, the Philippines, South Africa, India, and U.S.A. The family bonsai nursery was built by his father in 1947. As a child LO was at his father's side learning the art of bonsai and began teaching bonsai in Taiwan in 1992. In 2001 he started bonsai in Ken Kuo Technical University and in 2004, he become the bonsai teacher at Pei Tou Community University. The Chang Foundation was created by the late T. K. Chang with the aim of promoting interest in traditional Chinese art. Its museum opened in 1991 and is conveniently situated in central Taipei. It includes five galleries and a large lobby, with a total area of over 1,500 square metres. The lobby overlooks the museum garden, in which bonsai trees are regularly displayed.